Can it really curate personalised content? Giving you what you want? INQ, the erstwhile mobile phone manufacturer, has decided to get into the content game by using social media-powered info. 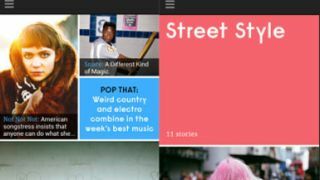 The Material app, which is currently in beta and only available on Android, doesn't just involve a list of news – it actively seeks to curate the news you look at based on your Facebook and Twitter profile. At the entry page you're asked to log in to Facebook and Twitter, and from there a profile is built. As you read more items, the app will learn what your preferences are, and will deliver a curated 'magazine' twice daily based on what it thinks you'll want to scroll through. It's very much a beta release at the moment though, with no functionality for tablets or the ability to 'unlike' things based on what you're seeing as targeted for your interests. However, INQ CEO Ken Johnstone told us that the tablet version was coming soon. He also pointed out that this 'discovery engine' was based on the power of the original INQ Cloud Touch mobile that launched a couple of years ago, which was also centred on using social graphs within Facebook to promote the content and people you cared about the most. The current iteration is middling in its ability to provide you with the information you really want, with elements like football bringing in both the European (proper) and American versions of the sport – and with no way to discard content from your feed, it can get annoying. Also, once you click on a story it can take an age to load within the app – which uses the standard Android web interface – but once in, it's great that you can continue scrolling down and get to the next article instantly. You can also add topics you think might be interesting, and twice daily the list will refresh based on what your Twitter following is doing. Johnstone told TechRadar that the idea was to work out what you cared about – so pulling up the author profiles of any writers you follow, for instance, will mean the app will try to offer content within their genre. It's a novel and ambitious idea, and if it can be done will be a great app for serving up the content that really matters – which is what we all want, after all, given our dependency on smartphone content when bored – but it could be a good few months of refining before this app is ready for the mainstream. However, it's available for download today, so head on over to the Play Store if you want to give it a go.